All the animal lovers out there might appreciate this one. 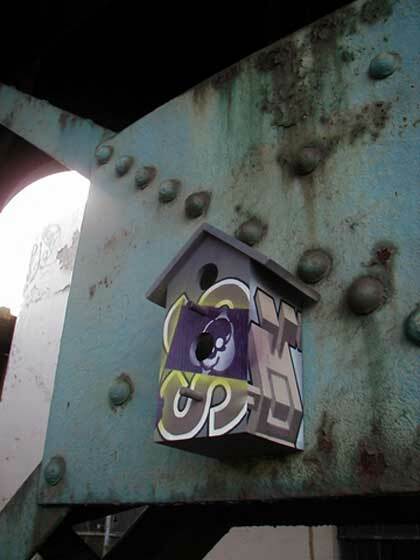 Uneek and the StreetSweeper Crew go around urban cities and put up birdhouses that fit in with the urban scene. Ming came over and complimented my flower washcloth. Well, he said it looked alot better than in the pictures. he then proceeded to wear i as a hat using the ends I haven't weaved in as the ties to his bonnet. He then tried to use it as a cat toy. paulie tried on my mondial hat and he just looked skeezy. so who did buy the chocolate sauce? Check out this subverse iPod. Really, it just comes preloaded with music that was controversial because Negativeland had sampled some of U2's music. But man, black iPods looks so cool! Dubya movie. Looks like a bunch of clips from Don Knott's old movies pulled together for a story of the current president. Speaking of Sims 2... Have you seen this site? It's hysterical. Made me contemplate buying the Sims for the first time in my life!